Anyone who’s known me for a long time knows that I have a thing for pigs. It mostly started with my adoration for Miss Piggy from the Muppets and then later grew into a general favoritism towards the animal. For awhile back in 6th grade I protested by not eating any kind of pig whatsoever. 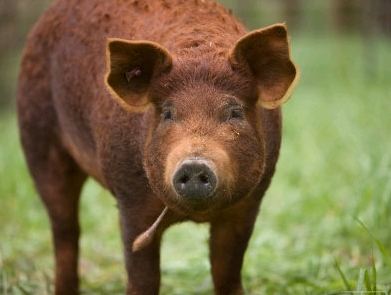 But in the case of the Red Wattle Pig, the only way to keep them breeding is to eat them! Last night I went to Almond restaurant and ordered the Red Wattle Pork Chop Adobo with charred tomatillo-avocado relish. DELICIOUS. Definitely the best pork chop I’ve EVER eaten. The waiter mentioned how this type of pig isn’t very popular on American menus because it has a lot of marbelization. Up until the early 1970s they were thought to be extinct until a small herd was found in Texas. These guys are heritage animals which refers to lines of farm animals unchanged by genetic modification. The pigs are raised in a “humane” way. They aren’t raised in confinement or given growth hormones or stimulants. So the lesson here is save the pigs by eating them! One of the great things about NY chefs is there continuous outpouring of generosity, not only to local food charities but to global causes. Owner Philippe Massoud of ilili, in the Flatiron district declared January 24 Haiti Dine Out Night in NYC. Ten percent of sales will go to as-yet-undecided Haiti relief charities. Plus, they’re asking servers to give 5 percent of their tips from that night. Here is a link from Grub Street, but a recent news report said there are already 37 restuaronts on the list. Hearth and Boqueria are great choices and I’ve been meaning to check out Knife + Fork.